Would you would like win one my Riding High hand-painted watercolour and ink illustrations? It's very easy - Go to my website leannebarrett.com and subscribe to my Newsletter by 14 February 2018 at 11.59 pm AEDT. When will the lucky draw close? The draw will close at on Wednesday 14 February 2018 at 11.59 pm AEDT. Do you have to live in Australia to enter? Yes. This lucky draw is only open to people living in Australia. If you live outside of Australia you are not eligible for this lucky draw. 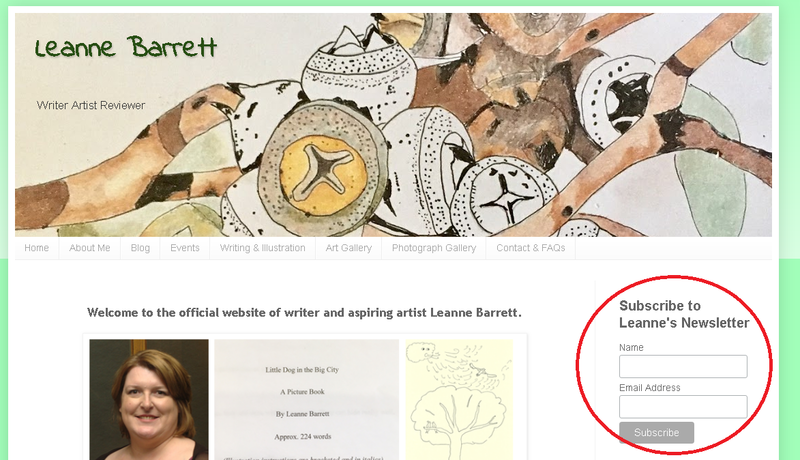 You are however welcome to subscribe to Leanne's Newsletter. Once you have subscribed to my Newsletter your name will go into a hat and one name will be randomly selected. This person will win the A4 unframed Riding High illustration which was exhibited at the SCBWI Storytime Exhibition in 2017 . How will the winner receive the illustration? If the winner lives in Canberra/Queanbeyan they will receive the illustration at date and time agreed to between the winner and Leanne. If a date/time cannot be easily arranged the illustration will be posted to you free of charge. If you live somewhere else in Australia the illustration will be posted to you free of charge. I just love connecting with people face-to-face and online. My Newsletter is all about connecting and making connections. I realise that in our busy world we don't find it easy to meet with people, that we often miss the social media or website post. That we don't always see the notice for an upcoming event. My Newsletter may help. Maybe you don't not use social media to connect with people. So how do you find out about things? Often it is through word-of-mouth or email. My Newsletter may help. My newsletter will be emailed to you up to 4 times a year. It will highlight all things literary and art. It will include sneak peaks at my illustrations and stories. Plus an overview of events or courses that I have recently attended. As a newsletter subscriber you will also receive invitations to my events and advance notices of any special offers. I look forward to enriching my connection with you.